In a workplace one tends to meet various kind of people, some are nice and helpful, others you might find who are aloof and busy with their work. Few can also meet the kind who are very friendly in nature but when the work comes they are the first to move away, or pretend that they are the martyr every time. Beware from this kind of people as these are manipulators, they like to have their own influence of people without putting in their hard work and gaining respect. These manipulators are the ones who will use the emotional factor as their bait to get you. Know them and deal with them is the only solution for you to survive in this situation. Manipulators are always the first one to come to you to help you, whether you want it or not. If you politely turn them down for help, they will pretend to be sad and upset about it. As if helping you is the most important thing for them. If in case you say yes, then immediately they will have some urgent work lined up to do and will try avoiding you. To deal with them ensure that you make them responsible for the work and if they are pretentious then better to tell them upfront on their face. Generally, you will see the manipulators as very soft spoken and overly friendly. They will commit to helping you in something and, later on, they will back out from their own words. You will observe that it is a frequent thing that happens with them. Pay attention to such people and ensure to stay away from them. Therefore, spot such people in the workplace and prevent from being dependent during work situations. Manipulators always tend to make you feel guilty of their own doing and acts as if you are the person who does wrong to them. If you are the kind who think that you are responsible for other happiness, then these manipulators will be the first one to target you. They will always come to you for help and if something goes wrong despite your efforts, they pretend that you might be the cause for the same. The best way to deal with such people is to maintain a distance and be straightforward when dealing with them. If you are caught in a web of a manipulator then the important part is it learn about the employee rules in a company. Because this is the first space where these manipulators hit you with your lack of information. They might make you stay beyond office hours to help you get their job done. No one within a company is allowed to harass, hurt or abuse another person if you are facing such situation then immediately talk to your HR person to help you sort this issue. Every person tend to have a degree of different persona depending on the people or location. For example, you will behave in a different way in your workplace as compared to home. If you spot a person who tends to change his attitude and personality frequently in front of every person then it is advisable to maintain a distance from this person. It is not difficult to spot such people around, so maintain little distance with them. One tends to spend most of their day’s time at work, hence, the possibility of making friends there also increases. You might unknowingly befriend a manipulator and does not realise their agenda before its too late. You will recognise them especially during the conflict or an argument between you two, while trying to resolve the issue the manipulator might be giving you silent treatment as it was your fault and you land up saying sorry first all the time, despite the fact you were not responsible for the issue. Hence, before befriending one, try to pick out the signs of their attitude and keep yourself away from them. A manipulator always plays with our emotions and they tend to find a hit on your weaknesses trying to make you feel inadequate. They try to put the blame on you for not being able to get the target results, hence, before blaming yourself for anything know that you are not the problem, but you are being manipulated for the other person’s sake. Who tried to put their mistakes on you. Ask if you have been treated well and respect? Are the expectations reasonable? Are you always on the receiving end? If you don’t find the right answers for this then it is the high time to face reality. If you know that you are dealing with a manipulator then another way to deal with them is by asking questions. Since manipulators tend to have unnecessary demands and try to put you in unreasonable situations. The best way to tackle them is to ask questions from them, For Example, if this will give the desired results, is the work reasonable? Or any other counter question which can, at least, make that person realise that you know he or she is a manipulator. 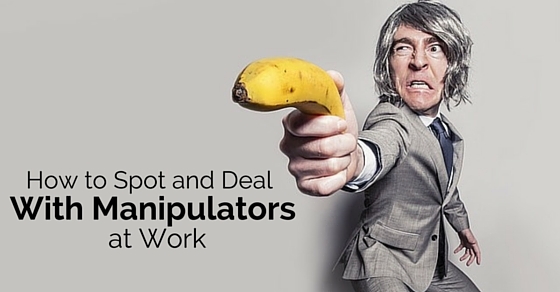 Manipulators are easily found in the workplace, it could be your teammate or your boss. For example, if you are working on a major project then the frequent shower of compliments about your capabilities and encouragement might come your way. You might even feel happy for it but when the credit and praises from your seniors are on your way suddenly some people take all the credit from the people who gave you compliments. While you might feel cheated, hence, prevent yourself from getting into such situations again. Better talk about this to your concerned senior. A manipulator mostly tends to expect the answer from you immediately. Rather than getting all upset and feeling under pressure better to tell them the fact that you need time to think about it. The manipulator will further try to pressurize you, but take a stand and prevent from committing to an early reply. This will shift the pressure from you to the manipulator. Take time, think and understand the benefits and loss before making any serious commitments. Ensure to have your own ground and stand in front the manipulator. Don’t be afraid with the person, know your basic rights and do what you feel best. Avoid saying yes every time to the manipulator, if you are not comfortable with the situation or a task better to tell them no on their face. Initially, you might find it difficult to say no but if you are not comfortable then better to say no rather than suffering, this will make you more courageous and powerful. Saying no to the manipulators makes them feel powerless and provides you not only confidence also charge over the situation. A manipulator gradually bully and preys only on the people who are weaker than them. They always look for those who will not reply back to them and are scared from them. Rather than being agreeable to them take a stand against them, because you will be their target till the time they see you as weak. It is said that bullies are the ones who have already suffered emotionally and physically in their life and they try to suppress others to prove themselves as powerful. If you see that at your workplace the manipulator is continuously harassing you then better to take charge of the situation and talk to the person, telling them that consequences that might happen if they do not improve their attitude. If you do not see the changes still, then better to talk to your HR person and request for a disciplinary action against them. Manipulators at a workplace can be anyone from your boss, manager or your colleague. Before you plan to deal with them, it is important to understand the kind of people they are and how they manipulate. If you have any preconceived notions about them, then it is better to remove it and see a clearer picture. Manipulators are generally subtle in their process of manipulation and sometimes it is difficult to figure one out. Therefore, you might be their victim for some time and the moment you are able to understand their strategy, better to act on it immediately before your reputation at work is at risk. Next articleHow to Be a Successful Woman in a Man’s World?